Ironically, my last blog post, Dealing With the Death of Daisy, was on my mother’s Earthday nearly 20 months ago! I began a 49 Day Challenge on that day to rejuvenate, revamp and recommit to my travel writing, book publishing and fundraising goals. I even had the nerve to end the post with the catchy phrase, “Don’t believe me just watch!” from performer Bruno Mars. Right! Growing Power was founded by MacArthur Genius Award winner Will Allen. As one of the world’s largest urban farms, Growing Power transforms communities by supporting people from diverse backgrounds through the development of Community Food Systems. I was inspired by Will’s story after listening to his interview on the Food Revolution Summit hosted by John and Ocean Robbins and decided to do a 3-month internship in Milwaukee. It Was Hard Work! Yet, that’s exactly what I wanted to experience. With absolutely no experience in farming, I wanted to see if I could handle the physical labor involved in preparation for the Pushing Daisy Drive’s goal of building a Eco-friendly health education center in honor of my mother’s legacy of service. I attended workshops on composting, beekeeping, growing mushrooms and micro-greens, yet most importantly I got used to working hard and having fun with my farm family! 1 Month Work Study @ Rodney’s Wellness Retreat, Inc. I had the opportunity to learn first hand what it takes to operate an Eco-friendly cottage and campground on Dominica, the Nature Island of the Caribbean. In exchange for room and board, I assisted RWR with social media and set up their You Tube Channel. You can view some of my interviews with satisfied guests here. I met Raven Blair Glover, founder of Amazing Women Of Power.com Radio Network at Sell More Summit back in 2015. We connected on the story of our mothers, since her mother’s death was the motivation behind launching her radio network. As fate would have it, I met “Raven the Talk Show Maven” right before her Amazing Moms Mother’s Day Celebration. Raven was looking to interview a few women who had lost their moms before having the opportunity to interview them, since that was the one interview she regrets not doing. 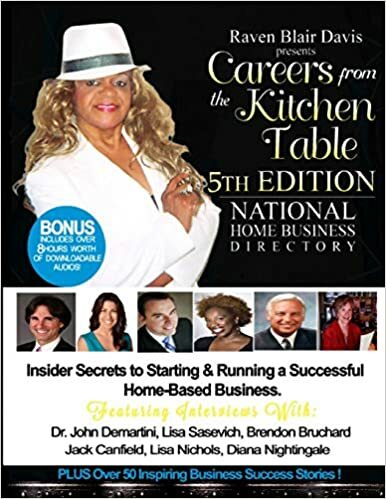 Fast-forward to 2016, I had the opportunity to be a contributing author to Raven’s book, Careers From the Kitchen Table: Insider Secrets To Starting & Running a Successful Home-Based Business, which includes 8 hours of downloadable audio and interviews with the likes of Jack Canfield, Lisa Nichols and others. My success story was titled, Writing to Recover From the Loss of My Mother. In December 2016, I attended a launch event for her patented Hat Wrap Design and CFTKT Book Launch. My goal is to raise $2,200 to attend CalEarth’s Permaculture Certification Combined Training in October. Applying early allows me to save up to $300 on the $2,500 tuition. In order to meet the early bird registration deadline, I’m including the CFTKT e-book free with a minimum $10 Daisy Drive Donation until UNTIL JULY 26th! May 26th-New Moon, Kick-off a consistent blogging schedule that includes travel stories, interviews, guest posts and podcasts. Visit the Posts Page to see the range of weekly posts planned. July 26th-Mayan New Year, Raise $2,200 to attend CalEarth Institute’s SuperAdobe Training & Midwest Permaculture Certification as part of Phase One of the Pushing Daisy Drive. Sept. 26th–Daisy’s Earthday, Complete the rough draft for my book Prayers of a Virgin: 52 Weeks of Poetic Inspiration and Personal Planetary Guidance with the Destiny Cards and “blook” the first 3 Chapters as part of a pre-crowdfunding campaign to publish the printed book by Nov. 14th, 2017. Thanks for reading! You can learn about other ways to contribute by visiting the Pushing Daisy Drive Page.